No amount of public relations stunts, spinning or press releases will change the fact that Malawians paid K466 million more on a contract that they should have paid less with their hard earned tax. A leaked Anti-Corruption Bureau (ACB) investigative report has named the ruling Democratic Progressive Party (DPP) as a beneficiary of a Malawi Police Service fraudulent procurement scandal. 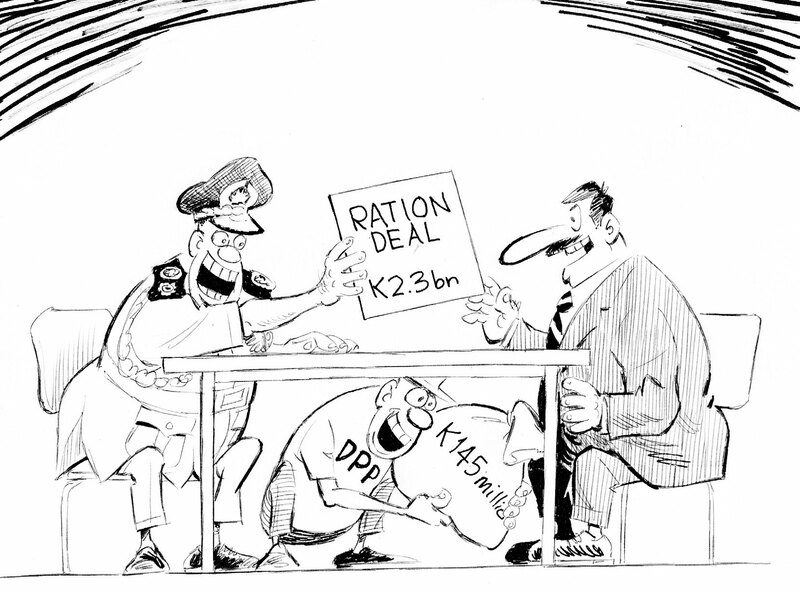 The party pocketed K145 million in a procurement scandal masterminded by some senior police officers that defrauded the taxpayers of K466 million in a ration racket of over K2 billion through a fraudulent contract the police entered into with businessman Zameer Karim. The businessman trades under a company called Pioneer Investments. 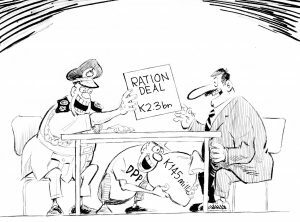 The hard facts are that Police entered into a contract with Pioneer Investments to supply rations at K2.3 billion in a contract whose shenanigans started way before it was signed in August 2015. Six days after the contract was signed, Karim wrote Police for a 20 percent upward adjustment citing the depreciation of the kwacha when that was not the rate at which the kwacha fell. But Police accepted it and paid him an extra K466 million without following procedures. Out of this money, Karim paid K145 million to DPP through an account which President Peter Mutharika, as a lone signatory, controls. The State House says the K145 million was a party donation and it is mad at an unnamed politician who it accuses of leaking the ACB report to the public, with a view to assassinate the character of the President. What is coming out quite clearly in this matter is that we are being governed by a party that is getting kickbacks from fraudulent contracts as the Police deal has all the hallmarks of that. As was expected, we, the citizens, the opposition parties and civil society organisations are mad and unanimous in our call that the President should resign or get impeached. But let us face reality. None of the above can happen in the present circumstances where Parliament is in the hands of DPP. We are stuck with the DPP for the next 10 months before we go to the polls on May 21. But we can draw positives out of this story. We, as Malawians, now know how we are being governed; that we have a system that can allow two people to go on rampage to milk the taxpayers of hard earned money through illegal inflating of the contract figure to make it rise way above what the Internal Procurement Committee negotiated. We know that a government department or agency such as Police can guarantee a contractor to borrow money from the bank to execute a contract even before bids have been invited, in the process fooling the poor, unconnected Malawians who wasted their time thinking that they were participating in fair and open contracting processes. After a local bank gave out the loan, the Police, who guaranteed the contract, were happy to pay the contractor directly forgetting that they guaranteed a loan for this same amount in the first place. Taxpayers will have to pay this money to the bank under duress. By all standards, this is a stinker for the President who has always disagreed with those who say corruption is getting worse in this country. When Vice-President Saulos Chilima was getting out of the DPP, he said there is just too much corruption and kick-backing in government, to which the President told him to report to the ACB. What would be government’s response to this stinker, in which 20 percent was added illegally to an already signed contract and paid out, a cut of which was given to the DPP? In fact, this contractor was continuing to try to defraud taxpayers by saying he should be paid interest because the government had delayed in paying him, something that was only stopped by former Auditor General Stevenson Kamphasa. The ruling party got K145 million out of a corrupt deal but the State House wants us to believe this was okay because it was a donation and the President did not know about it. The question is, now that the President knows, what is he going to do about it? I know he can neither be impeached nor forced to resign. The best he can do is to pay us, citizens, back our money. Malawians did not deserve to pay a single penny more on top of the K2.3 billion they paid for the Police ration contract. The President can hide behind the majority he has in Parliament and the protection of the State and its laws from anything. But he must know that is not going to stay forever as there is an election next year and I do not think Malawians are so daft that they can give power to somebody who they think abuses it. This is not the way, where their taxpayers’ money is being looted and abused wantonly in broad daylight, Malawians want to be governed. Are we surprised that we are not developing when people can inflate figures for contracts illegally and get away with it? As for the ACB, the nation is at tenterhooks waiting for its action on this matter. For the President and the DPP, the message is very simple: Pay back the K466 million, no more no less. It was stolen from Malawians.